This is a question that has received significant attention over the years. Many experts agree that eating in the evening is a problem because our bodies have the lowest need for calories during the evening hours. In America, meal size typically increases throughout the day and most eat more during dinner than any other meal. So why exactly are we so hungry later in the day and into the evening? Diets today have become so high in carbohydrates that we miss out on adequate protein in the morning and at earlier times in the day. One may have not eaten enough food or enough protein to stay fueled throughout the day. Another common etiology is that many Americans skip breakfast. When we don’t get enough food throughout the day, hunger hormones build up (mainly ghrelin – see below) making us HUNGRY and results in overeating for the rest of the day and evening. Our blood sugar levels can go up and they can go down. Ideally, we want to keep these blood sugars stable throughout the day as fluctuations can cause increased appetite in the evenings. The best way to keep blood sugars stable is to include snacks in-between meals, avoiding sugar and refined carbohydrates, getting a good macronutrient (protein, carbohydrate, fat) balance throughout your day, and to also include adequate protein sources in our daily meal plan. There are two main hormones that regulate hunger, these are leptin and ghrelin. Ghrelin is the hunger hormone (it lets us know when we are hungry). Leptin is the satiety hormone (which lets us know when we are satisfied or full). Stress and lack of sleep can play a role in the imbalance of these hormones causing us to overeat in the evening. It all depends on the types of food you are consuming at nighttime and be sure and ask yourself if it is true hunger that you are feeling or if you are eating mindlessly. 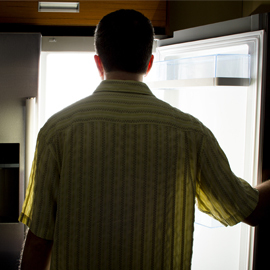 If you are feeling hungry, a bedtime snack can be extremely important for promoting stable blood sugar levels. It is important to consider what you have missed throughout your day- ask yourself, “Have I had enough protein today? Eaten enough vegetables?” Let this guide you to choose an appropriate snack.